Are you looking for a writing program in your homeschool? I have one that I can highly recommend! But first, let me tell you briefly about my thoughts on teaching writing. I have always been intimidated by some of the writing curricula out there. Another program I tried felt scattered and required too much writing of a young child. It even included craft projects. That’s a giant “No” from me on crafty writing curriculum. I knew I didn’t want to teach writing in the same way as public schools – lots of writing assignments, blank pages, and writing journal exercises. Let’s be honest – those just reinforce really bad writing habits in young children. I was impressed by the idea of classical writing methods when I read through the Well Trained Mind, so I decided to first try Writing with Ease. My kids did well and I enjoyed the program. But after using Level 3 of that program, I knew that we needed something different. Enter Writing and Rhetoric from Classical Academic Press. 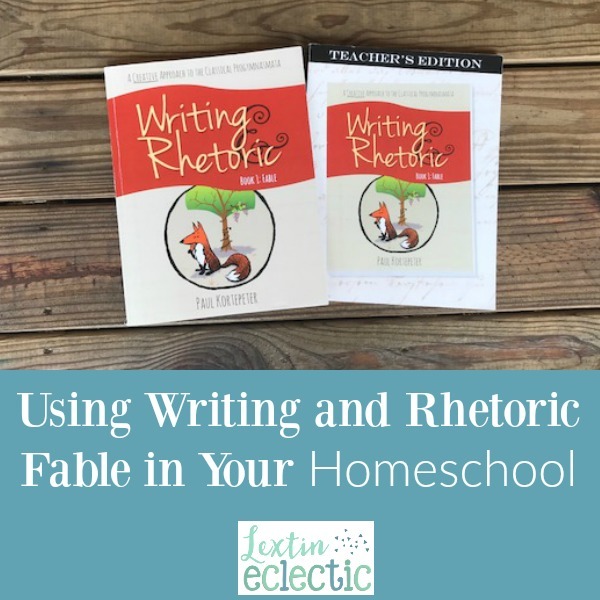 This is the writing program that I have been looking for in our homeschool journey!! Let me tell you a little bit about how the program works and then I’ll share why it is a perfect fit for our homeschool. Most of the levels follow the same basic structure, but for this review I’ll be chatting about the very first level – Fable. This book contains 14 writing lessons. The book was designed to be completed in one semester with completing 1 lesson per week. To complete the program in one semester, you would need to work on writing lessons 4-5 days per week. However, if using the program with a student at the bottom of the age range, it would also work well to cover 1 lesson every 2 weeks, completing only 1 book per year. We’ve used this program both ways in our homeschool. Both worked equally as well. What is the classical model? Writing and Rhetoric follows the classical model of teaching writing. I wasn’t familiar with this method until I read the Well Trained Mind, and I’ll admit that I probably still don’t fully understand it. The classical method uses copywork as a way to teach excellent writing through copying models of well-written work. Children are asked to read passages and then narrate back what they remember and understood from the reading. This helps teach comprehension skills while continuing to expose children to good writing. This is the process by which you dictate a sentence or a group of sentences to a child and ask them to write it down from memory without looking at the passage. This helps improve working memory, develops note-taking skills, and again gives the child to write samples of excellent written work. This takes narration one step further. The child reads or listens to a passage and then must summarize the main points of the work. This is a necessary skill to learn before being able to create outlines for writing. The classical method teaches through modeling good writing and having the child listen, copy, narrate, write, and summarize those passages. When beginning to write, the child is usually rewording or rephrasing the samples. This is in direct contrast to learning to write by simply writing original content. In the classical model, children learn to organize thoughts by first breaking down a model and outlining it (after narrating and summarizing the work). A child learns to create an outline before beginning future writing assignments so that the final written work is organized and clear. What does a lesson look like in Fable? Each lesson begins with a short fable to be read with the child. Then the child is encouraged to retell the fable in his or her words (while still using some of the words from the original story), in order to practice the skill of narration. Next, there is a short discussion about the fable. There are questions to ask to student about the content and the vocabulary in the fable. There is also a “Go Deeper” section for a more in depth discussion in which the child is asked to draw conclusions from the fable. The next few sections focus more on writing skills. First the child copies a sentence or two from the story. Next, you dictate a short passage to the child. Then there is the “Sentence Play” section, which is a favorite at my house. In this section, there are sentences from the story and the child makes various changes and enhancements – such as changing phrases and using different words while still keeping the original meaning of the sentences. The next section is called “Copiousness” and is where the child makes changes to sentences by adding different adjectives and adverbs. Sometimes the child even changes the nouns and verbs to create original sentences that are still similar in structure to the original sentence, but with new meaning. In the next section, the child is asked to complete a short writing assignment. Some lessons have the child next amplify parts of the stories to add details and make it longer. Other lessons have the child shorten the fable by summarizing it. At the end of each lesson the child practices the art of rhetoric (speaking well). There are assignments to read a poem or fable aloud to practice speaking or to memorize a poem to practice recitation. Each lesson begins with a story. In this first book, they are all short fables. Some of them have been new to us, but we have enjoyed all of them. They are fun and interesting to read. The program teaches through modeling. I firmly believe that kids cannot write well if they are not exposed to good writing. And good writers first learn from emulating great writers. This program teaches in a gentle way through modeling. There are no blank pages! The assignments are often to rewrite a sentence, change certain words, add to a sentence, or expand on a specific thought. The child is given a starting point and then asked to move forward from there. This method works well for even reluctant writers because they often need that starting point and hand-holding. The lessons are playful and varied. There are questions to discuss the meaning of the fable and vocabulary words. The lessons also teach the child to expand on sentences or change words to make sentences more interesting. It contains doable dictation. There are dictation passages in each lesson but I did not find them overly challenging for my children. In other words, they were never frustrated by the dictation passages. There are helpful writing samples in the teacher’s guide. These allowed me to see what type of writing to encourage my children to strive for when completing the writing assignments. This program has been a wonderful way to introduce writing skills to my elementary aged children. I have now completed up through the 4th level with my oldest child (5th grade). I love how her writing and creativity has improved through using this program.